Ideal when security is key. Kingstonâ€™s DataTravelerÂ® 2000 is designed to be secure, with an alphanumeric keypad that locks the drive with a word or number combination, for easy-to-use PIN protection. Its auto-lock feature is activated when the drive is removed from a device, and it deletes the encryption key after 10 failed intrusion attempts. It features hardware-based, full disk AES 256-bit data encryption in XTS mode. Encryption is done on the drive, not on the host computer, and no trace of the PIN is left on the system, for an advanced level of security. 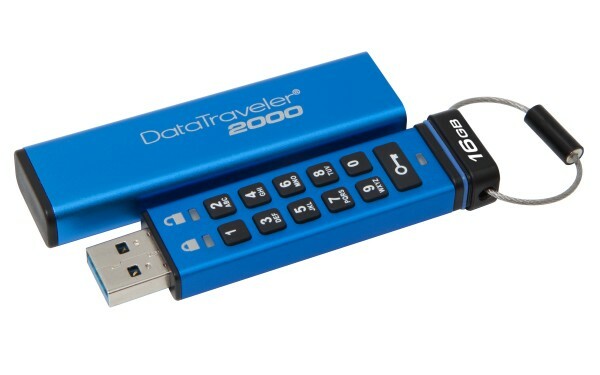 DataTraveler 2000 is OS independent and can be used on any device with a USB 2.0 or USB 3.1 Gen 1 (USB 3.0) port. Itâ€™s compatible with WindowsÂ®, Mac OS, Linux, Chrome OS, Android, thin clients and embedded systems, and the drive requires no software or drivers. Its durable design protects the drive from everyday elements such as water and dust. - Durable design protects drive from the elements.